The area centred on Wijnhaven was built up with office blocks immediately after the Second World War. Situated near the city centre and the river, it has been earmarked as a prime residential site since the late 1980s. Kees Christiaanse's urban strategy lays down the rules of play for developing the area. These include retaining intact the post-war structure of blocks to a height of 20 metres. Above that, there is a restricted available volume of 35 cubic metres per square metre of owned land, the only option being slim-line high-rise. Christiaanse himself is responsible for The Red Apple at the head of Scheepmakershaven. The 96 metre tall Scheepmakerstoren was originally designed with a single swish apartment per storey but has been built with a modified floor plan. The first buildings to arrive on site were HM Architecten's three Harbour Village apartment towers. 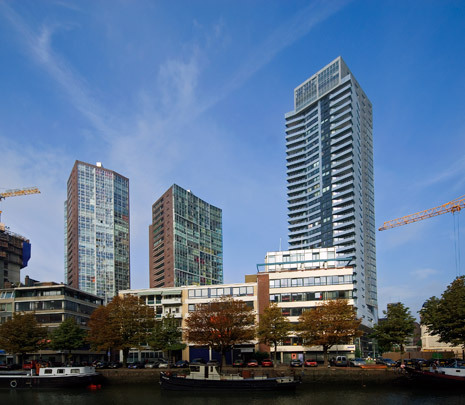 The first two towers, at 70 and 85 metres tall, stand on a relatively small plot between Bierstraat and Jufferstraat. The opaque facade surfaces are of brick laid in situ. The curtain walls are composed of storey-height PVC cladding panels which solves the problem of wind- and waterproofing the facade's distinctive shifts in and out of alignment. These shifts in the glazing lend variety and vibrancy to the facade in which the reflections vary too. The third tower, 109 metres high, takes up almost an entire urban block. Radically differing colours and materials have been chosen for it to avoid uniformity. The facades consist of two types of concrete cladding units: fancifully shaped light-blue panels with a surface structure resembling rippling water and dark greyish-blue ribbed concrete panels with black granite as an additive.